STRAITS ORGANIC 240｜Products｜IKEUCHI ORGANIC Inc. The beautiful wave patterns of the Seto Inland Sea have been portrayed in 100% organic cotton. 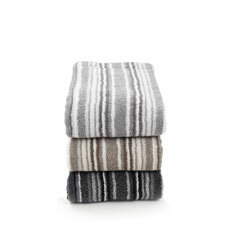 By weaving the whole towel up to the hem in looped pile, we have created a towel that has no unnatural feel at all. Wherever you touch, it is all towel. No part goes unused. Without getting too technical, there are two ways to color a towel; yarn dyeing and piece dyeing. Dyeing the yarn before weaving is called yarn dyeing, and dyeing the towel once it has been woven is called piece dyeing. Yarn dyeing is supposed to maintain the cotton feel and longer lasting comfort than piece dyeing. But is that really so? 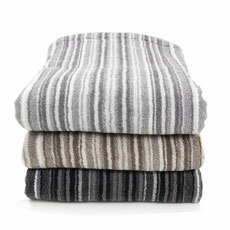 Please see for yourself by feeling one of the IKEUCHI ORGANIC yarn dyed Straits Organic towels. Evening on a sunny day in Imabari. The sky over the Seto Inland Sea after the sun has gone down will take your breath away. Somewhere far over the vast sea horizon day meets night, blending together in a mystical show of light and darkness. Those graduations are the inspiration behind the yarn dyed for weaving these towels. During this magic hour, the color of the sea seems to change each time you blink. Yarn in subtle graduations of color are used to weave the Straits Organic towels. Portraying the wave patterns of the Seto Inland Sea with colorful yarn dyed organic cotton.